Gregg Hanson has been promoted to Vice President of Sales & Marketing for the company. In this role, Hanson will assume additional responsibilities over marketing and consumer products, as well as continued oversight of industrial sales activities, including territory sales, inside sales, and customer service. He will report directly to Apache CEO, Tom Pientok. Hanson joined the company in February 2014, bringing with him more than 13 years’ experience in industrial distribution and product management. 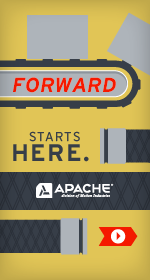 He previously served as Apache’s director of industrial sales. Steve Fournier has assumed the role of Director of Strategic Accounts. Formerly serving as an industrial sales manager, Fournier joined Apache in April 2013. His background includes more than 20 years in the industrial belting business, including management, sales, and business development responsibilities. Jon Rupert has joined the Apache team, assuming Fournier’s previous role as Industrial Sales Manager for the company’s Eastern Region. Rupert brings nearly 20 years of experience in sales, marketing, and strategic account management to his new role. Tom Walsh will continue to serve as Industrial Sales Manager for the company’s Western Region, and Barry Shaw, will continue as Customer Service Manager. Fournier, Rupert, Walsh, and Shaw all report directly to Hanson. In addition, Jill Miller, Marketing and Corporate Communications Manager and Jim Josendale, Consumer Products Manager also now report to Hanson.